Old MacDonald had a farm EEI EEIO. And on that farm he had a giraffe. With a slurp slurp here and a slurp slurp there, here a slurp there a slurp, everywhere a slurp slurp. Old MacDonald had a farm EEI EEIO. And on that farm he had a dog. With a woof woof here and a woof woof there, here a woof there a woof everywhere a woof woof. Old MacDonald had a farm EEI EEIO. Well it all started like all storms start: with rain and lots of it. Then came the wind, a wind that cold knock you over and sounded like a monster. Then things started to get frustrating the power went out when we were watching TV but luckily we had the fire going so we kept warm by huddling by the fire. When I went to bed I could see my breath and I had two duvets and another blanket. In the morning we still had no power and school was closed so was Tawa collage so I went to my cousins house but they didn't have power ether so we went to my Granddads and warmed up while my Mum went to work. We just went back and forth until my Mum came home and we had power again. In a small town on the border of India strange things were a usual happening. Every now and then things would go missing like a sheep or a cow. But when Osama, a loving father, husband and hard worker went missing well lets just say the the town freaked out. Osama's son, his name was Kerpal. Now Kerpal had light brown hair much like his fathers his face was always burnt due to the fact that he loved the outdoors and his family was not at all wealthy. He was rather short and skinny but not so that he looked like a beggar. His nose was slightly bent inwards as a consequence to too many fights his eyes were the colour of the sea on a stormy day which seemed very weird since neither his Mum nor Dad had the same colour eyes. I'm going to teach you how to sharpen a pencil in three simple steps. Okay this is a very simple task you only two things, one pencil and one pencil sharpener. Step 1: Get you pencil and sharpener in hand. 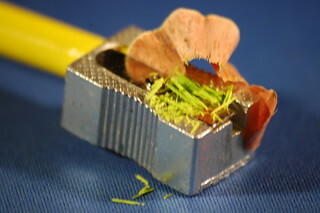 Step 2: Insert the pencil into the sharpener and twist the pencil clockwise. Step 3: Dispose of the pencil shavings into the rubbish bin and enjoy you'r sharp pencil. Once upon a time there was a little boy called Billy Bruce Willy. Every day Billy would chow down a fat sheep. But one day Billy found some haggis and decided to eat it. Because of that his face started to burn. Because of that the skin on his face started to shrivel up and fall off. Because of that his parents took him to a doctor and were told Billy needed surgery so he got a new face. Until finally his face fell off completely. Ever since then people avoided him because they thought he was a zombie and that he would eat their brains. The moral of the story is, don't eat haggis.